If you really want to change your body, get lean and defined, build muscle, and have boundless energy, then you have to work hard. But hard doesn’t mean long. From Thinspired: How I Lost 90 Pounds—My Plan for Lasting Weight Loss and Self-Acceptance. Hard doesn’t mean long. You should also be working smart, and that means you don’t have to spend hours at the gym. You don’t have to run ten miles. In fact, you shouldn’t be working out for too long, because at a certain point your performance takes a dive. You’d be surprised how quickly you can get an intense, amazing, results-­producing workout. If you work smart, and hard, 25­-45 minutes four to five times a week will be enough. Your goal at the gym should be to get in, kill it, and get out. For most of us, that means un‐learning everything you know about cardio. Most people think that the way to burn fat and get into better shape is by doing the same exercise for a long time. For example, they’ll decide to take up running, and run six miles at the same pace. That’s called steady state cardio, because you’re not varying your intensity at all. But new research shows that varying your intensity is actually much more effective. High-­intensity interval training (HIIT) involves alternating between short bursts of high and low intensity. For example, on a treadmill, you might sprint as fast as you can for 45 seconds, and then recover with a light jog or a walk for 45 seconds. You repeat this for 25 minutes, 45 seconds on, 45 seconds off. The goal is to spike your heart rate at maximum intensity, and then bring it back down. The important thing is that your high‐intensity intervals are actually high intensity. Intervals of jogging and walking are not going to be effective. During your high-­intensity interval you should be running like someone is chasing you. HIIT really is a gift from the fitness gods. Not only does it feel more manageable thanks to brief intervals, and give you a really great workout in a short amount of time, it’s also more effective than long periods of lower intensity exercise, like jogging. You burn more total fat, and overall you’re exercising at a higher intensity. HIIT has been shown to increase your aerobic capacity faster than traditional training, which means you’ll be noticeably more fit much sooner. But best of all, HIIT gives you “afterburn,” which is the fitness blessing of all blessings! After interval training, your body will continue to burn calories for up to 24 hours, while you go about your normal life. This does not happen with steady state training. In short, you’re getting a more effective workout in less time. How’s that for a win-­win? Weight training is another way to work smart. Muscles burn more calories than fat, which means if you have more muscle mass, you’re going to be burning more calories in general, even when you’re doing absolutely nothing. Building muscle is a way to get your body to work in your favor, helping you to lose weight and be more efficient overall. Just like with cardio, you have to work hard while strength training, or you won’t build muscle. Here’s how your body builds muscle: when you lift a weight that’s heavier than what your body is accustomed to, it tears and damages your muscle fibers. Later, your body repairs and rebuilds these fibers, and your muscle grows. But your body is good at adapting, and very soon it will be used to the weight you’re lifting. The only way to build muscle is to submit your body to more stress than it’s used to. The only way to do that is to lift progressively heavier weights. If the weight you’re lifting feels easy, then you need to go heavier. You should go as heavy as you can without sacrificing form. Ladies, don’t buy into the myth that lifting heavy weights will make you bulky. That’s nonsense! Women who look like bodybuilders work incredibly hard to get that physique. In many cases, that’s their career, and they devote a tremendous amount of work and discipline into getting that body. Don’t kid yourself and think you’re going to look like that simply because you pick up a 15-­pound weight. If only it were so easy! Lifting heavy is another way to cut down your time at the gym. You don’t need to do a million reps with a lightweight. With a heavy weight, you can get great results by doing three sets of eight reps. Just make sure the weight is heavy enough that on that eighth rep, you really feel like you couldn’t possibly do one more. Remember, it’s smart and hard, not one or the other. A quick note about working hard, for all of you overzealous readers out there—push yourself, but don’t be dumb. The last thing you want is an injury, because that will take you out of commission for a while. You know yourself better than anyone. You know when you’re being totally lazy and could do more. You also know when you’re really pushing it and are likely to get hurt. Listening to your body is just as important as challenging it. Fear of repeating dieting setbacks or experiencing new ones can be a major mental obstacle that keeps many from making healthy changes. 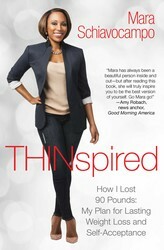 This inspirational book from ABC News correspondent Mara Schiavocampo takes you on her journey of weight loss—and helps you shed pounds and find peace, health, and happiness in the process.